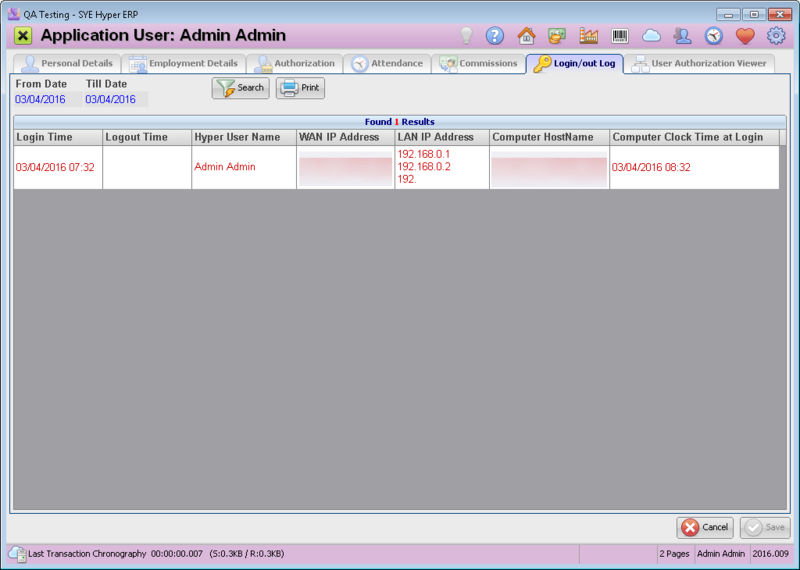 This tab displays the login and the logout time of the employee, for the selected dates. At the top of this tab select the required dates and press the search button. Login Time The login time of the user. Logout Time The logout time of the user. Hyper User Name The user name, as defined in Hyper. Computer HostName The host name of the local used computer. Computer Clock Time at Login The date and time of the login, in the local computer. This clock time can be different than the clock time of Hyper's server. By pressing the Print button, at the top of this tab, this table can be printed. This button also allows to save this table as PDF file or send it by Email.